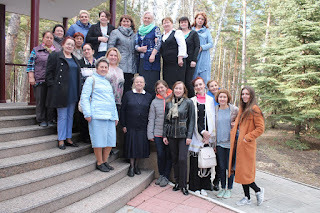 From May 2nd to the 7th in the Omsk oblast the women's seminar of the Evangelical Lutheran Church of the Urals, Siberia and Far East - “Jesus Christ – the true caregiver of souls.” This hinted at the broad theme of the seminary – pastoral care and counseling. Sister Louisa, a deaconess from Germany, analyzed Jesus' conversations with people from a pastoral care point of view. Nina Dmitrieva (Vladivostok) and Anastasia Razinkova (Shelekhov, Irkutsk oblast) gave an overview of the upcoming World Day of Prayer for 2019. 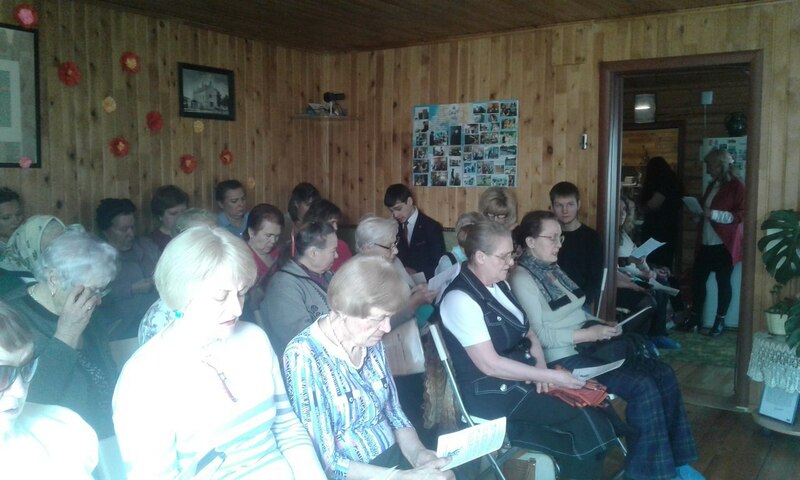 Tatyana Serevbrova (Krasnoyarsk) introduced the seminar and ed a lesson on women in the Bible. Besides this participants enjoyed the natural pine forest, sang hymns, prayed together and shared a warm atmosphere of fellowship. 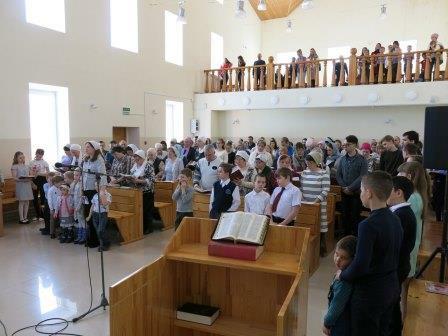 On June 17th in Volchansk (Northern Urals, Sverlodvsk oblast ) the dedication of the prayer house of the congregation took place. For a long time the congregation, which has more than 40 members, waited for this event. Now they have their own property - a space which, before becoming a grocery story, had been a regular apartment in a 5-story residential building. 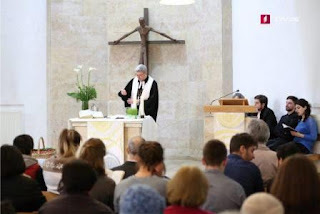 Bishop of the Evangelical Lutheran Church of the Urals, Siberia and Far East, Alexander Scheiermann presided at the dedication; the sermon was given by the Dean of the Urals Woldemar Jesse (Chelyabinsk). Dean Vladimir Vinogradov (Omsk) and Pastor Matias Schindler (Nizhny Tagil) also took part. 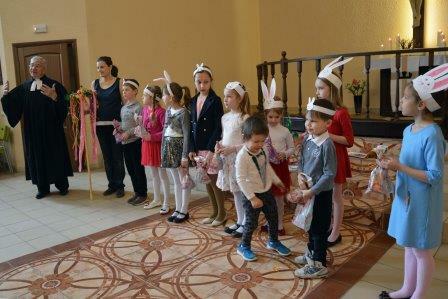 The administrator of the ELCUSFE Tatyana Muramtseva also addressed congregation with congratulations. Church Council President Andrey Gubashov and head of the Sunday School Svetlana Janzer, speaking for the whole congregation, thanked everyone who helped with their prayers, with their work and their finances. 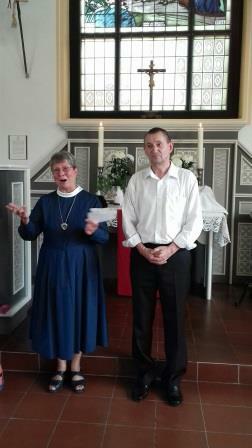 One of the most memorable moments from the celebration was the reading of the poem for the occasion by Elvira Schmidt. 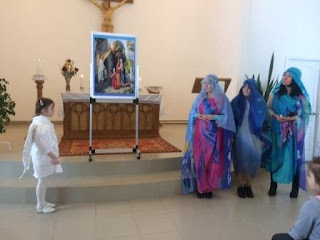 She was the one who began the work of rebirth of the congregation and for many years served in it; she was called away to the Lord a week before the dedication took place. We wish the congregation and their new space to be light and salt for those around them. Levashovo is not far from the city now. Right beyond the green fence are dachas and picturesque places of rest for city residents. For many years the fence protected people from the secret evil which inevitably comes from death, pain and treachery. 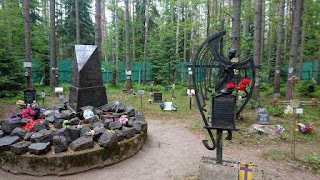 In the village of Levashovo near Leningrad from 1918 to 1953 there was a special execution grounds of the NKVD – KGB of the USSR, the so called “Levoshov wasteland.” Bodies were buried right here where they were shot. 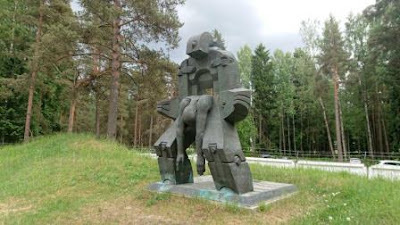 Levashovo is the the largest secret burial ground of victims of Stalinist repression in the Leningrad oblast and one of the largest in the whole former Soviet Union. 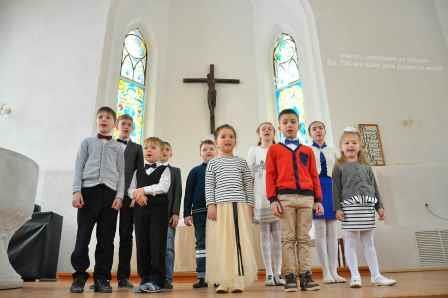 Germans, Finns, Ingermanlanders, Estonians, Latvians, Lithuanians, Belarusians, Ukrainians, Moldovans, Jews, Assyrians, Tatars, Norwegians, Italians, Poles, Russians.... People who spoke various languages and people who could not speak at all or not near, but living in peace with one another. They lay together here in common graves, well-covered from seeking eyes by trees and the sea sand that was brought here. They waited. They waited for their descendants to remember them and for the truth to prove stronger than the “top secret” stamps of the soulless state. Janis Ritvars in his article on these repressions gives the horrifying statistics of the loss: “as a result of two campaigns held in 1941 and 1949, 58557 people were deported from Latvia without investigation or trial. In then end at least 189931 people from Latvia were repressed for political reasons.” Many families still feel the pain of loss and are carrying with them the results of their loss of human rights and citizenship, of being orphaned, abused, and left without education, of being denied their native language and traditions. Various civil groups such as “Memorial,” ethnic clubs, the museum of genocide, the museum of the History of the GULAG, historians' books, plays and poems, memories of surviving pastors, personal witness of congregational members and our guests and friends from Latvia and Estonia as well as documental and artistic films have worked together to not let this memory be forgotten, despite universal fear and silence. The number of burials in Levashovo varies in various sources – from 19450 to around 46000. They were officers and soldiers of the First World War, scientists, poets and authors, politicians, doctors, church workers and congregational members, musicians, workers, teachers... These were “social aliens” in society, educated, active and, therefore, dangerous. Our congregation lost 23 people here. Perhaps more. As the Ukrainian consul put it very exactly when speak about this place - it is a bloody spiderweb of cemeteries. At present we are continuing to carry out historical research in order to better remember our brothers and sisters who were touched by and sometimes destroyed by repression. From June 8 to 12 a seminar on women’s ministry led by the husband and wife team of Gotthild and Erika Stein was held in Kazan. More than 20 women from various cities around Russia (Kamyshin, Cheboksary, Orenburg, Moscow, Samara, St. Petersburg, Ufa, Naberezhny Chelnov and Saratov) took part. There were also, of course, members from St. Catherine’s Lutheran in Kazan, as well as a participant from Vinnitsa (Ukraine). 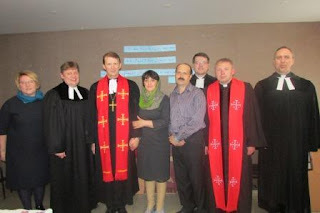 Her participation was an important sign of the unity of Evangelical Lutheran christians in Russia and Ukraine. Many have known each other for many years insofar as the tradition of women’s seminars has been preserved already for 15 years; four cycles of the “Life Stages” seminar have been held, and yet are constantly in demand. 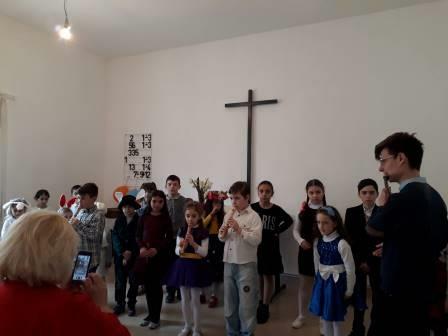 During the first day everyone got acquainted with one another and found a place to stay in the dormitory of the Roman Catholic congregation of the Holy Cross. 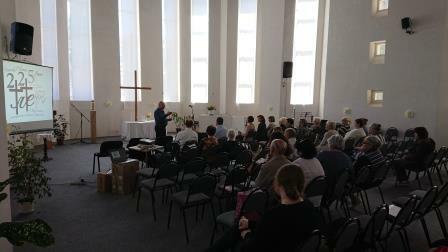 The seminar itself began on the second day with teachers Pastor Gotthilf and Erika Stein from Stuttgart. Pastor Stein is retired, and Erika leads the “Life Stages” Bible study in her retirement. 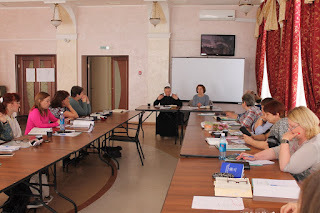 Ruth Stubenitzky, the translator for the Novosaratovka Theological Seminary, prepared the materials and interpreted for the seminar. The theme of the seminar was God’s blessing and was based on the Old Testament story of Jacob. For the whole seminar Erika led us through his life story. We met his parents (Isaac and Rebecca), his brother Esau, his wives Lila and Rachel, and his children, through whom God established the 12 tribes of Israel. Together with Jacob we felt both the joy of God’s blessing and reckoning for the deception of his father, felt banishment from home, saw the staircase to heaven on which the Lord Himself was standing and gave Jacob a new promise. We experienced many other twists and turns in Jacob’s life (from blessing to hopelessness, from hopelessness to new blessing) during the seminar. This happened thanks to the well-thought-out and heartfelt work of Erika Stein. She presented the whole Biblical story of Jacob in the memorable form of installations. Step by step together with Jacob we went along his path and learned to recognize God’s blessing running through our whole lives and remaining relevant even during the most difficult times. Erika used this example to show us that God knows our names and cares about every one of us, as He knew and cared for Jacob. Both during the seminar and during one-on-one discussions Erika attempted to show God’s limitless love for us, the heavens opened up for believers, and living faith in the Lord. 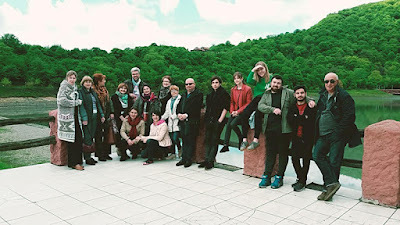 During the breaks between lessons and in the evening we walked around Kazan, a city we liked very much and which impressed us very much with the beauty of its streets, parks and buildings. 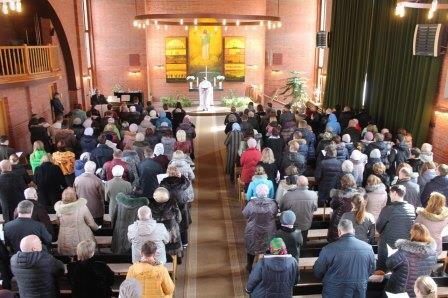 On Sunday we took part in worship with Holy Communion at St. Catherine’s Lutheran, presided at by Pastor David Gorn with the sermon by Pastor Gotthild Stein. Many thanks are due to the hosts - the congregation members of St. Catherine’s, for the organization of the excursion around Kazan, for their work in organizing breaks during the seminar, and for their kindness and tireless care. 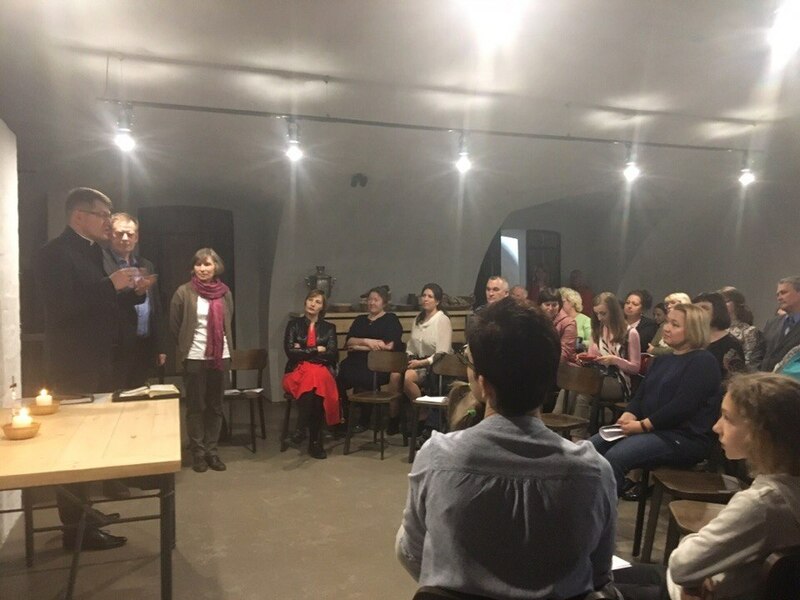 We thank the organizers of the seminar: the Dean of the Samara Deanery Olga Temirbulatova and the Dean of the Central Denery Elena Bondarenko. Their preparatory work ensured that the seminar could take place. 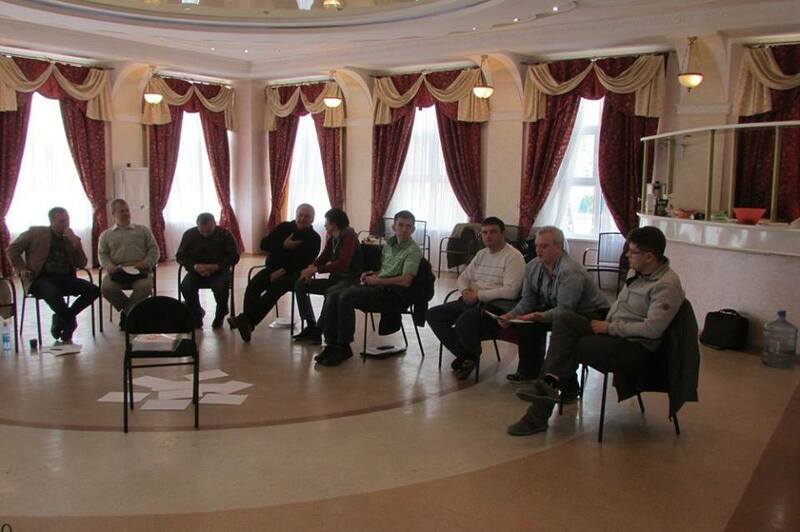 We are thankful to brothers and sisters in Gustav Adolph Worke foundation who provided support for the seminar. The Committee on Women’s Work for the foundation has already supported these seminars and other ministries for 15 years, including this year. 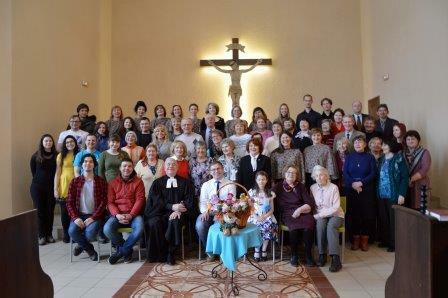 This support has done much to assist women in the Evangelical Lutheran Church in European Russia. 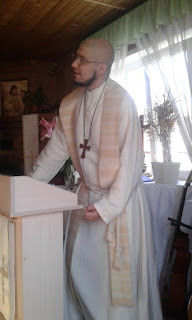 “We’ve been given so much!” This was the feeling that filled those who were blessed to have taken part in the recent (May 23-27) seminar for men’s ministry in the Union of Evangelical Lutheran Church (former ELCROS). A sense of deep gratitude to God for everything that He sends us filled filled these days, and it acts as the basis for our thoughts about how we might use God’s grace for the good of our congregations and for those outside of them. The central image of the seminar was “overhaul” which combined in a surprising way with the Biblical story of Joseph in such a way that participants could consider the unfulfilled potential in their lives. They “looked under the hood” and made a diagnosis of what needs to be changed, considering what “tools” could be helpful in the road of discipleship. physical in order to gain new experience and to meet new challenges (for example, many tried bowling and a ropes course for the first time in this seminar), thereby gaining confidence for everyday life. responsible for financial questions and for Bible studies, while Vladimir solved many questions related to organizational issues and led interactive exercises related to psychology and pastoral care. Participants came from Bishkek (Kyrgyzstan), Astana (Kazakhstan), Kiev (Ukraine), and from Russia (Vladivostok, Krasnoyarsk, Omsk, the Ulyanovsk deanery and the Northern Caucasus deanery). Unfortunately visa issues got in the way of the increasing the geography of the participants to include Georgia. Some of the participants are long-time leaders in the church, while some were new; just as significantly, the context in each of our churches is quite different.Yet in these days together all of these differences faded into the background as they felt unity with one another, had fun with one another, prayed with one another, thought together with one another about how the Holy Spirit is working in the churches and in each of us. 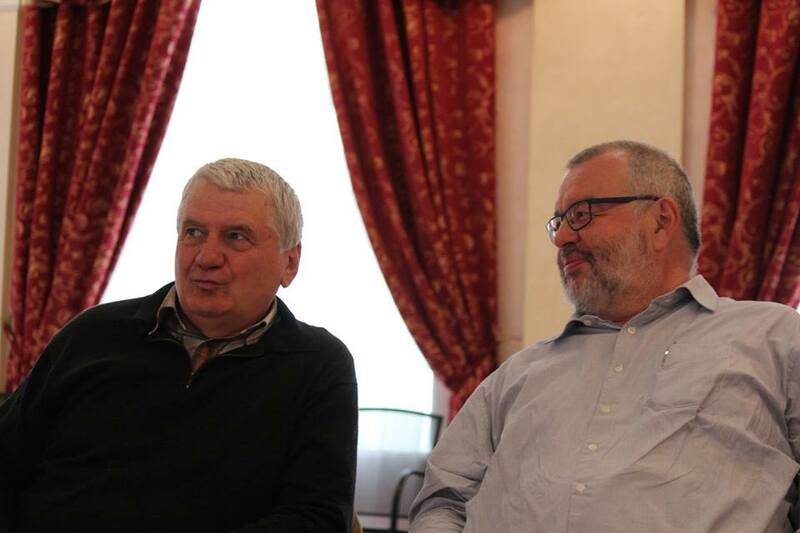 It is rare to have such a chance to get together these days, but such meetings give participants energy and inspiration to try something new in their lives and in the lives of their congregations. The organizers and participants of the seminar would like to thank those who made this seminar possible - in supports of the “Equipping for Service” program in the ELCA and ELM. It is the common hope that those who took part in the seminar will able to continue their “overhaul” work back at their homes in order to strengthen the spiritual lives of men and in order to invite others into Christian fellowship. 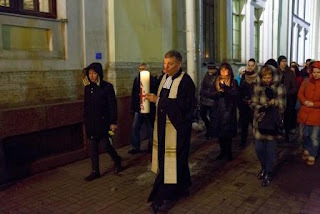 MoscowOn Pentecost, May 20, at Sts Peter and Paul Cathedral in Moscow there was a guest preacher – Rev. Dr. Christian Samurai, the ambassador for international relations for the Tamil Evangelical Lutheran Church of India. 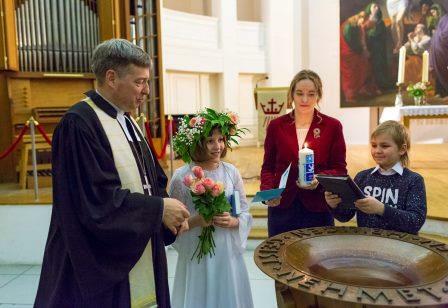 He came to Moscow together with his wife and daughter at the invitation of the Evangelical Lutheran Church of European Russia. After worship there was a meeting of the congregation with Mr. Samurai. He spoke about the history of the beginnings of Christianity in India, tied with the name of St. Thomas. The guest spoke in detail about the problems of Indian Christians, which experience persecution because of their faith in a country where the majority of believers are Hindu and also emphasized that India and Russia have long-time friendly relations. The reverend doctor prayed for the blessing of the Holy Spirit on the congregation and asked to pray for Christians in India. In conclusion Dr. Samurai signed copies of the May congregational newsletter with his photo. 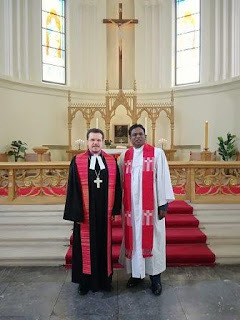 A day earlier, on May 19, the guest from India took part in the Pentecost vigil service in the Cathedral of the Immaculate Conception of the Virgin Mary. The Lutheran congregation was also represented at this ecumenical service by the choir of the French-speaking congregation, Preacher Artis Petersons, Dean Elena Bondarenko, and also one other guest – Duverte Kaper (Netherlands). 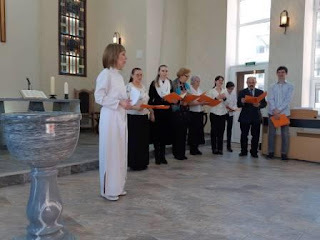 The ordination of Natalia Chizhova and the installation as pastor in the Gusev region Alexei Chizhov were held on June 3 in the Salsburg church. This pastoral couple will serve 8 congregations in the regions. And they will both have responsibilities for pastoral care in the Carl Blume retirement home in the village of Zadorozhe. 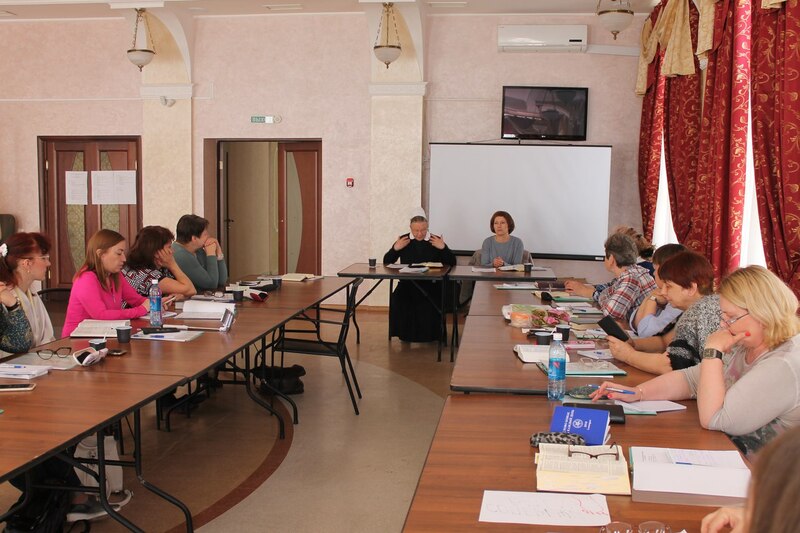 Natalia and Alexei are graduates of the full-time program of the Novosaratovka Theological Seminary. 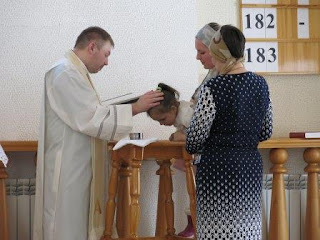 During the past years – Alexei served as a pastor and Natalia as a deacon in congregations of the Evangelical Lutheran Church of Ukraine, a member of which Natalia had been since her youth, having grown up in the city of Poltava. Alexei is originally from Kazakhstan and came to the Theological Seminary after he and his family moved to the Volgograd region. The ordination and installation were led by Archbishop Dietrich Brauer. 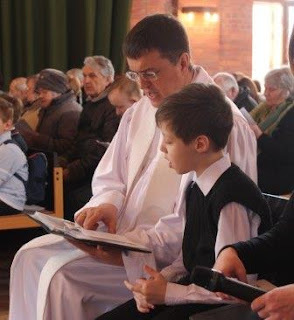 He was assisted by Igor Ronge and other representatives of the region and guests, including Pastor Haye Osterwald, who for 12 years (1996-2008) served in the Kaliningrad deanery – first as pastor in Gusev and then – from 2002 – as the head of the deanery. 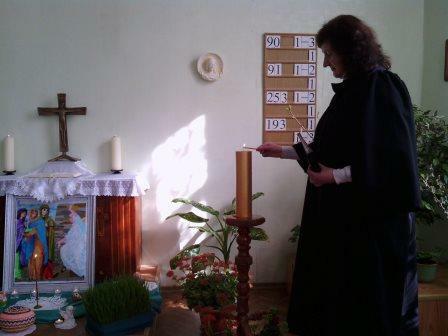 Pastor Elena Kurmyshova who had been serving as the pastor in Gusev will now begin her service in a different region of the deanery – the village of Bolshaya Polyana. “Twenty years – step by step.” That was the name of the celebratory program dedicated to the anniversary of the Diaconal center in Gusev in the Kaliningrad oblast, June 1-3. There were many guests from around the region, from Germany; Archbishop Dietrich Brauer from Moscow was also in attendance. “The Diaconal Center of Gusev” is an important social ministry project of the Kaliningrad deanery of the Evangelical Lutheran Church of European Russia. At present 5 trained deaconesses care for 23 patients – in general these are handicapped people without families. 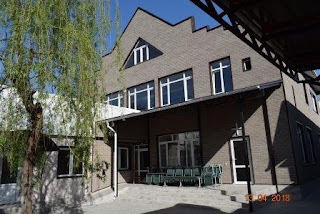 The diaconal center was registered on June 1, 1998 and was one of the first such church projects in Russia. The founders were the Kaliningrad deanery and the "Stiftung Salzburger Аnstalt Gumbinnen" foundation from the German city of Bielefeld. 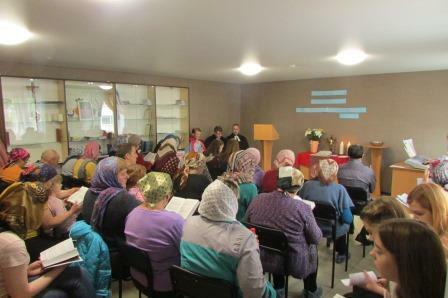 The project began with educating women in this area of ministry through the courses lead by deaconess Erica Zeising from Bielefeld. 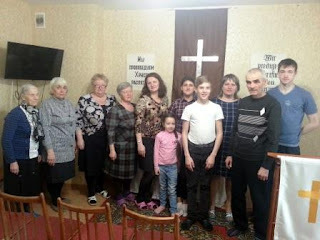 At that same time a group of people in the congregation took the initiative to make home visits to shut-ins together with Pastor Haye Osterwald and to provide for their basic health needs. At first these congregational members were volunteers; from 2000 it was possible to pay them for their work. But the people who receive the help receive it for free. Also from 1998 to 2017 lunches for children from needy families from the city were served. And during the summer holidays summer camps are held for single mothers who raise handicapped children. The “Gusev Diaconal Center” has everything necessary for the care of those who are homebound – from bandages and pampers to creams and gloves as well as crutches and wheelchairs. Much of this has been brought to the center by volunteers from Germany – both individuals and as representatives of various organizations. Over these 20 years these people have supported the center's ministry. For that reason at the anniversary celebrations there were over 130 people from various places. It is difficult to measure the degree to which the center's sponsors have helped those in need throughout these two decades. 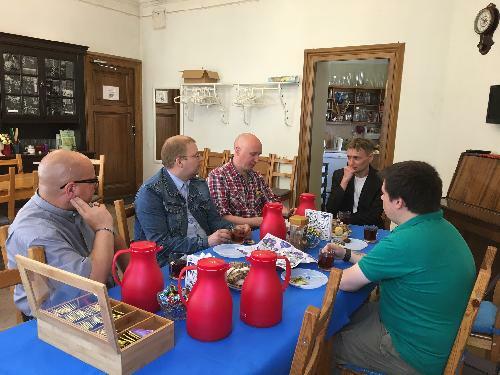 On June 3 to 5 those seminary graduates who recently passed their final exams were gathered together at Sts Peter and Paul cathedral in Moscow for a seminar. Artis Petersons (Moscow), Nikolai Deminov (Sol-Iletsk), Valentin Nikolaenko and Alexei Kolosvo (St. Petersburg) in conversation directed by the seminary leadership (President Anton Tikhomirov) and dean of the Central Deanery, Elena Bondarenko shared with one another their experience of studies and practical ministry, took part in the worship in the cathedral, and listened to Seminary President Anton Tikhomirov's lectures on homiletics, as well as met ELC Archbishop Dietrich Brauer. While the internship of participants of the seminar from St. Petersburg is just beginning and for Nikolai Demonov it will continue, Artis Petersons passed his colloquium with very high marks and received his long-awaited seminary diploma. 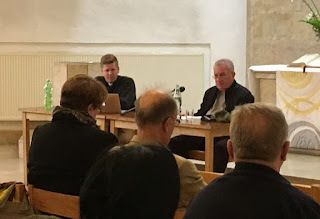 A pleasant addition to the seminar's program was a visit to the Catholic Institute of St. Thomas and discussions with its rector, Father Stephan Lipke, as well as time spent together in fellowship and walking around the city with one another. 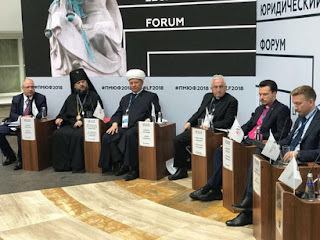 On May 16 Archbishop Dietrich Brauer took part in the work of the 18th Petersburg International Legal Forum, where representatives of traditional religious groups debated the issue of the relationship between the state, society and religious organizations, including the question of the mechanics of state support of religious organizations. 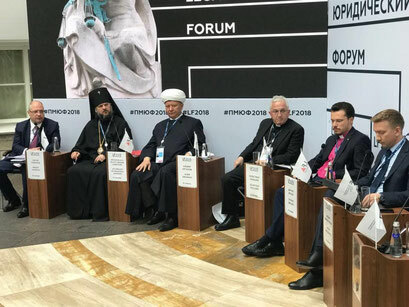 The moderator of the group was Sergei Gavrilov – the representative of the Duma committee on the development of civil society, societal and religious groups. 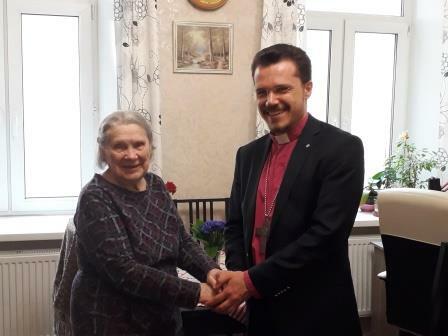 During his visit the Archbishop also visited one of the oldest members of our church, Edith Muetel, the author of two volumes of memoirs, the latter of which (“I Remember. From Petrograd to Petersburg through the Volga and Siberia”) is in Russian and was printed with the help of the St. Petersburg city government. In addition he had meetings around other issues including the preparation of lay preachers for the Northwestern Deanery, restoration work at Petrikirche, the activities of the Theological Seminary and work on the liturgical handbook that is in the process of preparation. “The dedication of St. Mary's in Saratov is a long-awaited and happy event. 225 years have passed since the dedication of the first St. Mary's, which was located in the center of the city and was barbarically destroyed when it was blown up in 1971. 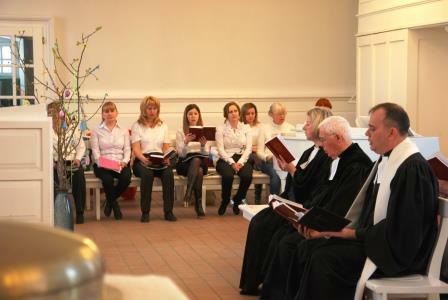 The history of Lutherans in Saratov was interrupted for quite some time. Later the congregation was organized and began to meet in various places. On Sundays congregational members met in basements, and for big holidays they rented halls in order to fit in all those who wanted to attend. Then the congregation began to build a new church; 25 years have passed since the congregation was reborn, and for more than 10 years now the new church has been under construction. 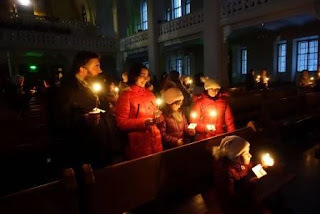 The work was done only by fellow believers, both Russian Germans and others who show their care and concern. Both individuals and church groups have taken part in this good deed. The process of construction stretched out throughout the years, and even now the work isn't done, but the main work has been completed. At the end of this stage we decided to dedicate the building in order that the congregation could feel that it was already in a fully-functioning church building. It can hold up to 200 people. Worship services are already held in the sanctuary, and there are many spaces for use by the Sunday school, for other ministries and even a small fireside room which creates a special atmosphere for meetings and discussions. 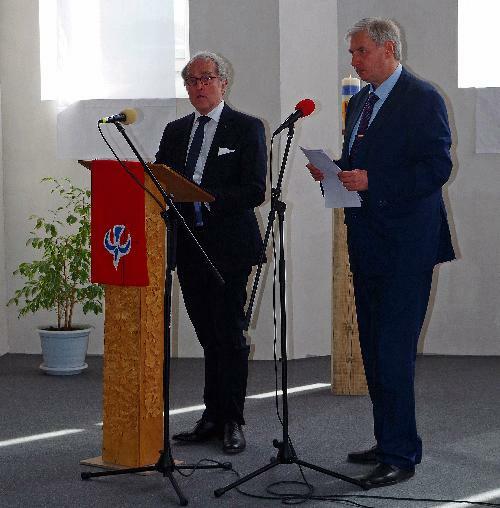 It was quite impressive that the Ambassador of the Federal Republic of Germany, Rüdiger von Fritsch, came to Saratov for the dedication of the building. 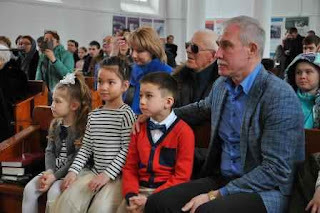 Every year he visits one of the Russian regions, and he came to Saratov specially for the the dedication of the church and the celebratory worship. What is more, he came not strictly as a government official, but as a preacher. Rüdiger von Fritsch is not only an ambassador, he is a theologian and is blessed as a preacher in the Lutheran Church. He has preached, for example, in the Bavarian Lutheran church when he was the ambassador in Poland and was happy to agree to give the sermon at the celebratory worship service in St. Mary's church. In his sermon the ambassador spoke about the New Covenant of God with man, the covenant based on the blood of Jesus Christ, His grace, His mercy. The preacher placed this imagine in the context of the event, in the context of Russian Lutherans and the Saratov congregation, which lost its building, lost hoped, but did not lose faith. This faith and the faithfulness of God, His faithfulness to the covenant that He once made with his people, saved and strengthened people during all times. 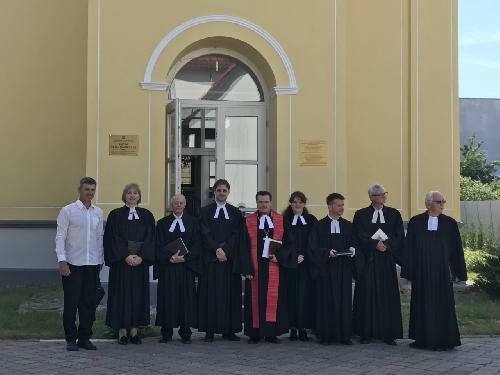 “Today, during the dedication of the new St. Mary's church, the faithfulness of God to his covenant has been fully shown;” with these words the German ambassador brought his sermon to a close. 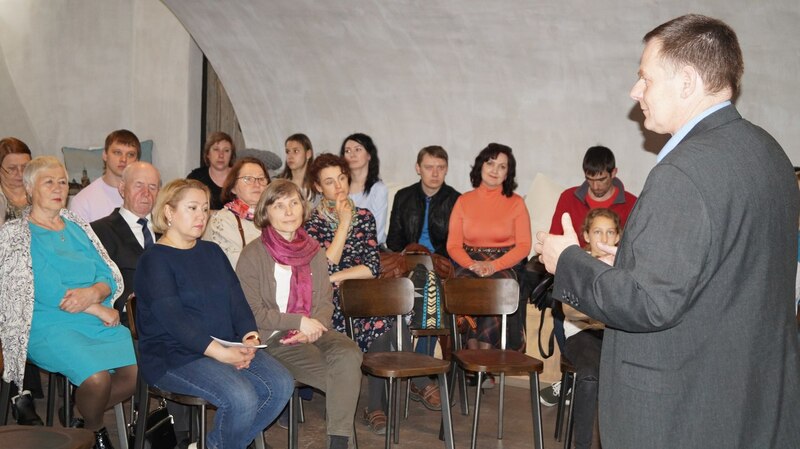 The participation of the ambassador of Germany in the events in Saratov drew attention not only to his person, but also to the problems of Russian Lutherans, to the needs of congregations. We are very thankful to Ambassador Rüdiger von Fritsch, for his attentiveness to and interest in Russian Lutherans, for his active participation in the finding solutions to many important problems. In our days people frequently speak in the language of confrontation, of sanctions and threats. And the fact that a person can speak in a different language, heart to heart, the language of spirituality, the language of faith – it is very inspiring! As he noted in his conversation with local journalists, the Ambassador’s main goal of this visit was to be present at the dedication and worship service, but many other events were also organized for him. He enjoyed visiting the city and oblast very much and spoke of his intention to visit again on a personal trip together with his wife. It is a joy that three church buildings in the region are being restored at once: the new St. Mary's, and two historical buildings in Zorkino and in Marx. In the former local businessman Karl Loor has led the efforts, while in Marx it is brothers Alexander and Viktor Schmidt. 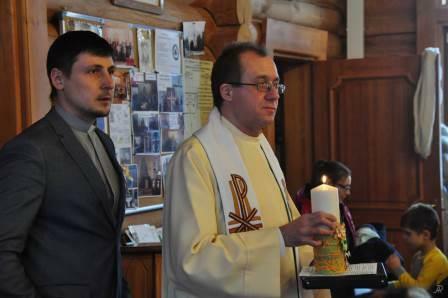 On May 13 Pastor Thomas Graf Grote officially concluded his ministry in the congregation in Shelekhov (Irkutsk oblast). On that day the congregation said its goodbyes with pastor Grote – a person who in many ways was responsible for the congregation's coming into existence. Its foundation was unusual. “First I came to Irkutsk as a representative of a German trading company in order to develop the lumber market. It was necessary for me to do so because I couldn't find work in Germany as a forester. 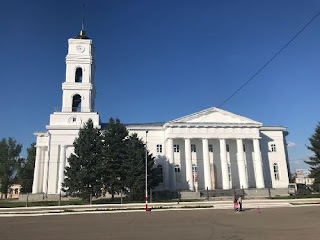 However I quickly fell in love with Russia, and in particular with Irkutsk - this huge country with limitless possibilities and very hospitable people. In 1995, four years after the fall of the USSR, a social worker who cared for the needy founded a group of Scouts that specialized in working with children and youth from disadvantaged families. This group helped the kids find meaning in life. A year later I began to take on an active role in this scouting group....from which eventually a independent Christian congregation was born. This congregation needed an official status, and we made the decision to join the Evangelical Lutheran Church of the Urals, Siberia and Far East. Since there was no pastor available for this congregation the Church asked me to work on the church's legal status and to assume leadership. I stopped my work in lumber and became a student of the Theological Seminary of our church in St. Petersburg; I finished in 2006 and was ordained.” Later Pastor Grote also established contact with a special religious group in the village of Pikhtinsk of the Irkutsk oblast – Polish-speaking, ethnic German Lutherans who moved from Volyn to the Siberian taiga at the beginning of the 20 century. He was their pastor for many years. Now pastoral duties (with the exception of the Sacraments) for the region will be in the hands of Anastasia Razinkova. 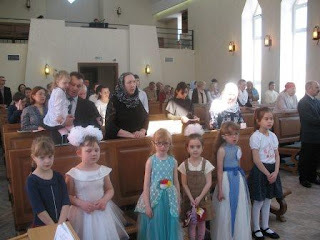 Her official title will be the representative of the Evangelical Lutheran Church of the Urals, Siberia and Far East in the Irkutsk oblast. She will also be responsible for two social ministry projects - “Istok” (a village with ministry with the handicapped) and “Tsvetnaya planeta” (a project dedicated to the well-being of the developmentally disabled through art therapy). 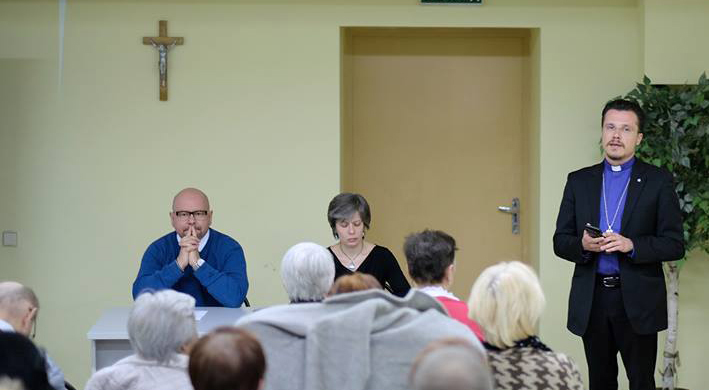 “These changes will be in large part useful for the Shelekhov congregation since I have been here already more than 20 years and the time has come when Anastasia can bring fresh ideas into the congregation,” Thomas said. 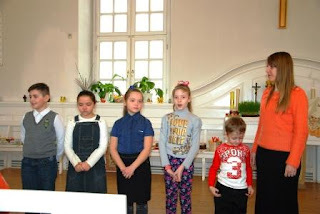 Anastasia grew up in this congregation. 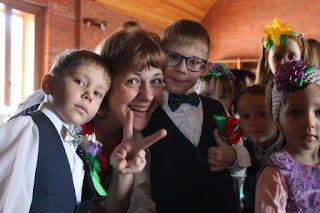 After successfully completing her theological education in the full-time program of the Novosaratovka seminary in 2012 and an internship in Germany, she worked in the church as the coordinator of children's and youth ministry in eastern Siberia. This experience will help Anastasia in her new position since the congregation in Shelekhov is made up mostly of young adults that grew up in the Scouts (herself included) and their children. Dean Vladimir Vinogradov installed Anastasia and wished her inspiration and fruitful ministry. 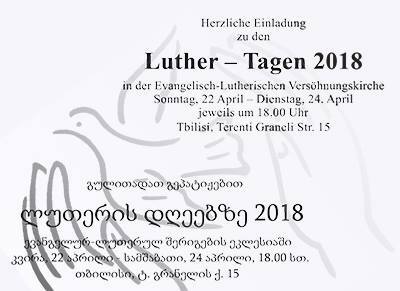 I arrived in Tbilisi again just before the “Luther Days 2018” held in the Evangelical Lutheran Church in Georgia, April 22nd-23th. I was especially happy to see Cuttino Alexander, our former intern and now pastor in Ocean Springs, Mississippi, who six years after his internship returned to Georgia together with his wife Jessica and small son Daniel. “freedom and religion” from an Orthodox point of view, and Dr. Anton Tikhomirov, President of the Novosaratovka Theological Seminary, from the point of view of Lutheran theology. The question of freedom and its relationship to humankind, society and the state plays an important role in all religions. Freedom is a particularly Lutheran theme insofar as Martin Luther during his whole life sought for himself and for his fellow Christians the freedom based in faith in the forgiveness of sins. He understood that not only the state but the Church itself can become an enemy to Christian freedom when it makes a person dependent on itself; this freedom is given only by God's grace. In this regard Georgi Andriadze noted critically a number of situations in which the state and the church in Georgia meddled in one another's affairs. 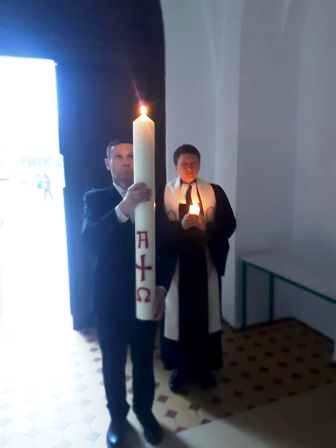 He also expressed his hope that the Georgian Orthodox Church would someday return to the World Council of Churches, which is left around 12 years ago. Anton Tikhomirov laid out the Lutheran teaching on the two kingdoms, the divine and the civil, which mutually effect and complement one another. The first of these is there for salvation while the second is for the preservation of Creation. Cuttino Alexander described the leading role of Church and Christianity in the USA for the constant renewal of the state and society and their unity in the spirit of freedom. He noted that the controversial nature of current American politics is a large challenge for the churches. There were more people attending, including more guests from outside the ELCG this year than in previous years. It was important and useful for our church in Georgia that for the first time one of the presenters at the Luther days was a representative of the Orthodox church. 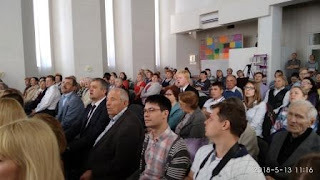 From April 20th to 22nd in the congregation in Kvareli a seminar was led by Seminary President Dr. Anton Tikhomirov from the St. Petersburg and the Bishop of the Evangelical Lutheran Church of Georgia Markus Schok. The themes of the seminar were the life and theology of Martin Luther as well as our Church. It is worth noting that this was the first time that the congregation in Kvareli has had such a collection of guests. Church staff, pastors, and youth sat next to one another with an equal level of interest and engagement and this made for a lively, creative atmosphere. 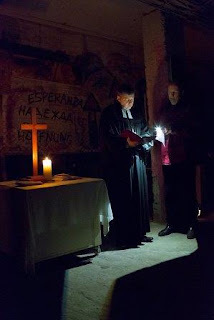 The theme of the second day was the life and theology of Martin Luther. Anton Tikhomirov spoke about the Medieval context of the Reformation, the daily life and religious experience that affected Luther. We saw how the Reformation developed in stages and how it became the basis for the teachings of both Lutheranism and many other Protestant denominations. Everyone took part in conversations; the youth, too, were active and tried to grow in knowledge. That means that the youth love their church and want to actively participate in its life and to take on responsibilities for ministry. This is a great sign that our church has a future. 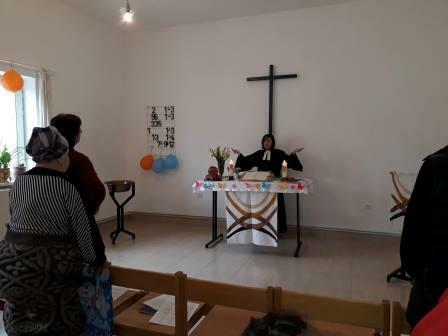 In the capital of Kyrgyzstan on April 8th a long-awaited event took place – the dedication of a new house of prayer – the main cathedral of the Evangelical Lutheran Church in the Republic of Kyrgyzstan (ELCRK). The Archbishop of the Evangelical Lutheran Church in Kazakhstan, Yuri Novgorodov, was present at the dedication, as were all the pastors and preachers of the ELCRK and many congregational members from the local and nearby (Vinogradnoe, Tomoka, Nizhne-Chuisk, Belovodskoe, Kant, Kirovskoe) congregations, the German ambassador, as well as guests from Germany and Kazakhstan. The previous prayer house was partially destroyed in a fire on January 27, 2015. While that day was a tragedy for church members, now the new building has opened up its doors and it a wonderful reason to celebrate. The words of greeting that could be heard all around - “Christ is risen!” took on a special meaning this year. During the celebratory worship service ELCRK bishop Alfred Eicholtz recalled with tears in his eyes what horror he felt as he heard watched the church burn and heard the bell as it crashed to the ground together with the bell tower. He remembered the questions that were asked to which he had no answer at the time - “Why didn't your God help you?” He shared his thoughts about how it is especially important to trust God especially when you don't see how His Providence is leading, when you can't find any answers. Time has shown, said the bishop, why God allowed the fire to happen and how He has been glorified in its restoration. All who gathered for the celebration met in the church's courtyard. In front of the entrance and then during the worship service there was music by the Chyusky chamber orchestra. 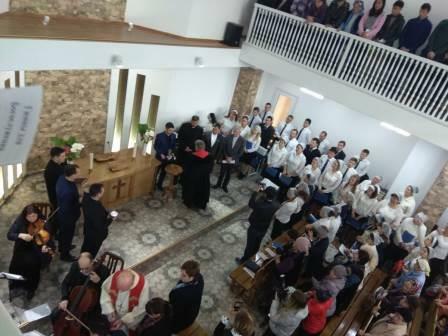 The bishop greeted those who were gathered and introduced the architect Sergei Karchin and Pastor Valentin Limanovich, who was responsible for the detail work on the building. During worship the mixed choir of the ELCRK (more than 50 people!) sang. It is worth noting that despite the fact that the congregations are spread out, people in the congregations know each other relatively well thanks to regular church-wide events; they were particularly happy to meet this time. No one was a “guest,” but felt that this building would be their common home; after all, each in his or her own way contributed – whether it was through finances, through donating food, or by working on the cleanup after the fire. 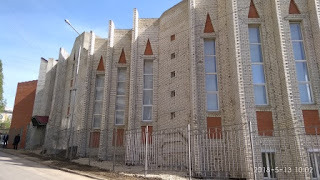 Everyone was praying constantly for God to bless the Bishkek congregation and all were thankful to the Lord for His work to make the building happen.The lack of a church building didn't get in the way of congregational ministry. Even on the day of the fire, despite the tragic event, the scheduled Bible study took place all the same. People who came to Bible study that day didn’t know what to expect, and saw before them the sad picture of burnt church. That Bible study, which was held in the nearby building of the seminary, was very memorable. The ministers who smelled of burning and smoke, dejected by what had happen, called on everyone to humbly accept God's will and to trust Him in this difficult situation. 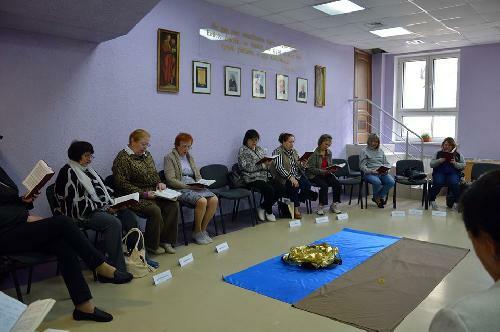 From that time until April 8th of this year, meetings of the Lutheran congregation in Bishkek took place according to their regular schedule in the building of the seminary, and congregational life didn't stop even for a minute. This confirms the Biblical teaching that the Church is not a building, but Christians gathered in the name of the Triune God. Bishop Alfred Eicholtz thanked everyone for their contributions to the restoration of the cathedral. He spoke about the importance of the words of support he received at the time from various parts of the world. It wasn't just members of the ELCRK who gave offerings for the church, but many others who sympathized with them and gave what they had. 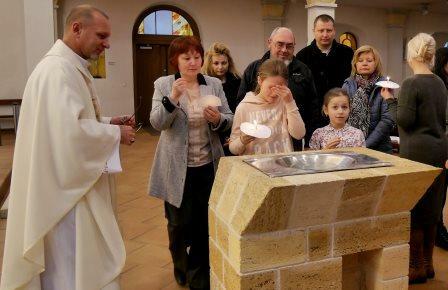 Bishop Eicholtz spoke about the coins gathered by children in the congregation in Astana as a symbolic offering that was passed on at the time by Bishop Novgorodov. The latter in his sermon said that all the participants of the restoration had received “a kiss from God” insofar as they became builders of His house. “You can build many houses, but building God's house comes around once in a lifetime.” He emphasized that the pain that brothers and sisters underwent in Bishkek was felt by the church in the whole post-Soviet territory. He gave them an altar Bible and passed on congratulations from all the Lutheran Churches that are part of the Union of Evangelical Lutheran Churches. The celebratory events lasted from 9 in the morning to 6 in the evening with a lunch break. 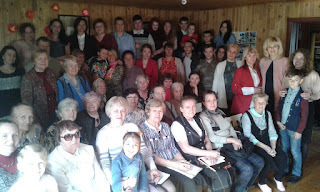 The congregation in Bishkek as the hosts invited the guests – more than 300 – to lunch. Hot pilaf, prepared outside over an open flame, and hot and sweet tea were ideal for the cold weather on this spring day. All the guests wished that sounds of praise and thankfulness to God would never go quiet in this building and that it become a real home for many who have found salvation there . Former congregational members who have moved to Germany were also present at the event; among them were Woldemar Schal and the former president of the Synod Alexander Schantz. In their words of greeting they emphasized how important it is that the Lord's house be filled with people. Eduard Penner led a group of guests from the German “Society of Evangelical Lutheran Germans from Russia.” He said that their society closely follows the developments of the church in Kyrgyzstan, and in their quarterly newsletter there is a block of news about their church. When Christians in Germany, especially those in “brother congregations,” heard about the 2015 fire, they were filled with sympathy and a desire to help. While they knew that God can certainly work in places without any walls, prayer houses are something that we people need, since they help us to come together around God's Word. Eduard Penner addressed the congregation with the wish that their building would become a place of meeting between God and man so that people could see Him there, hear Him and praise Him, and that through the Lord's Supper come into communion with the Church. He noted that the new church in Bishkek is one more piece of evidence of God's love which calls us to learn to trust God during all the stages of our lives. 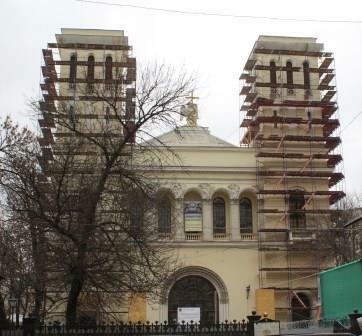 Restoration work on the facade of Sts Peter and Paul Cathedral has begun! The state-financed work is scheduled to be completed by October 30, 2018. The “Arkada” company put in the winning bid for the work and began to prepare the site on April 2nd. In the first three weeks the church's two towers were “clothed” in scaffolding, and the statues of St. Peter and St. Paul were enclosed in special protective boxes. 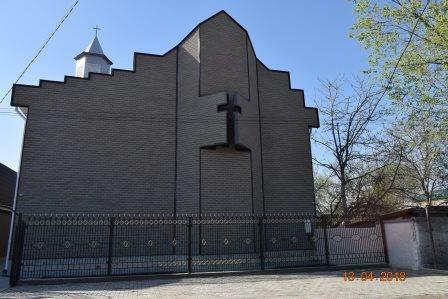 The project preparation was completed using church funds and includes the full restoration of all the entry doors, windows, towers, walls and exterior decorations. On April 15th Sts. Peter and Paul Cathedral in Moscow hosted a conference dedicated to the legacy of the the 20th century martyr, Lutheran pastor Dietrich Bonhoeffer. “The life of Bonhoeffer is one of testimony and martyrdom;” with these words the Archbishop of the Evangelical Lutheran Church, Dietrich Brauer, opened the conference. Bonhoeffer ”looked straight into the eye of the very difficult question what it means to be a Christian, what it means to follow Christ, in an inhumane environment, in a totalitarian state. He clearly and without fear point out to his Church the threats that faced her.” As a pastor he called Christians to “wake up, come a live, grow up, and the Church to stop sleeping and keeping silence, to stop being self-interested.” Bonhoeffer needed to remind his congregation members that the Church “cannot be the church of Luther or the Church of the German people. It belongs to Christ;” Bonhoeffer himself became a “living sermon,” the Archbishop said. He also touched on the theme of “religionless Christianity” that is found in Bonhoeffer. “The Christian faith is not the same as the Christian religion or worldview. A sermon is not a pious template. It should be ‘religionless,’ accessible, understandable.... A person becomes a Christian not through a religious ritual but by taking part in the sufferings of God in everyday life. That is what metanoia is, not to think first of all about your own troubles, problems, sins, and fears but to allow yourself to be drawn to the path of Jesus Christ...” the Archbishop said referencing the memorable words of the martyred pastor. 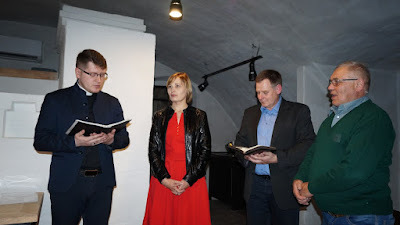 «Religionless Christianity” was the central theme of the conference, with two author theologians, Professor Svetlana Konacheva from the Russian State Humanitarian University and President of the Novosartavoka Theological Seminary, Dr. Anton Tikhomirov also speaking on the theme. Tikhomirov spoke about Bonhoeffer's poetry as a place where he sought a new language for “religionless” Christianity. based on the article by Yulia Zaitseva, www.blagovest-info.ru. Pictures from Easter celebrations from congregations of the Union of Evangelical Lutheran Churches.